At Studio 27 Architects we have successfully obtained Prior Approval for conversion of agricultural buildings into new residential properties under permitted development rights. The Town and Country Planning (General Permitted Development) (England) Order 2015 allows owners of agricultural buildings to convert them to dwellings under a simplified planning process known as Prior Approval, subject to certain restrictions. So if you have an agricultural building that is under-used, why not contact us to see whether it has the potential for a conversion? A recent RIBA report about the architectural profession has highlighted clients' frustrations with architects not being able to deliver during both the concept stages and the technical design stages. Many clients are appointing one architect to undertake pre-planning services, and another to complete post-planning services. It appears that many practices in the profession are either geared up for delivering concept design work, or technical design work, but rarely both. This is of course a great shame not only for the profession, but also for clients, who would presumably much rather retain one architect from start to finish, and in doing so avoid the inefficiency, unnecessary expense, and inconvenience involved with having to find a new architect once planning permission has been granted. At Studio 27 Architects, we regularly work with clients from inception right through to completion, undertaking highly conceptual feasibility work and ‘strategic design’, through to highly technical work such as the delivery of BIM models and data for facilities management, and performance of the Principal Designer roles for the purposes of the CDM Regulations. Key to this is our desire to foster an in depth understanding of our client’s needs and aspirations right from the outset; whether that is understanding the business goals and branding of a commercial client, or the lifestyle and stylistic preferences of a domestic client. This important step allows us to manage a project properly and deliver a bespoke service to each and every client, with a consistent team for the duration of the project. If you are considering appointing an architect, bear in mind the advantages of appointing somebody you can trust with all stages of the project, from the very exciting initial design phase, through to the nitty-gritty of statutory legislation, contract administration, and energy efficiency. Please do visit our services page for more information about what we can do to help you, or contact us to arrange a free initial consultation. "Even though I only spent a few days with David and his team I felt like my time was very beneficial. I learnt about the different aspects that I would never have thought I would be able to do! Including using and learning about ArchiCAD, a programme that I wouldn't have been able to learn about or even try without this work experience placement. I am therefore extremely grateful for this opportunity. Not only did I learn a variety of things within the office but I also got the chance to visit a construction site and see the plans in real life, this made it seem more realistic and it was satisfying to see the plans transform into a building. When I first arrived at the office I was soon taught all about the Architect guidelines, the code of conduct and a plan of work and this gave me more of a clear understanding about this profession which is what my aim was for this experience. Not only did I learn a lot about the profession but also David has given me clarity on the pathways (e.g university) to take to get to being an Architect and this is the most valuable thing I have learnt this week as it has not only given me direction for the future but it has also inspired me to look towards my future in architecture." We will be offering another placement next summer, so if you're considering your career options, please let us know as soon as possible as demand for a placement is often very high. BIM is 'Building Information Modelling' and as far as we are concerned, its going to be a hugely positive thing for the construction industry. BIM is the process of constructing an intelligent 3D model of the building inside the computer, and then using it to extract huge amounts of useful information for all sorts of different purposes. At the simplest level it ensures full coordination of our drawings, and allows us to present our clients with 3D images of their project. At the more advanced end of the spectrum, BIM allows for accurate energy evaluation, take-off of quantities (measuring each element of the building for pricing), and the model can even evolve with the building long after completion to provide a detailed repository of useful information for facilities management, all of which can be accessed using free software. Having recently purchased our own licenses for the BIM authoring software ArchiCAD, we have taken our first few steps on BIM ladder and we can already see the huge benefits it will bring to us and our clients. 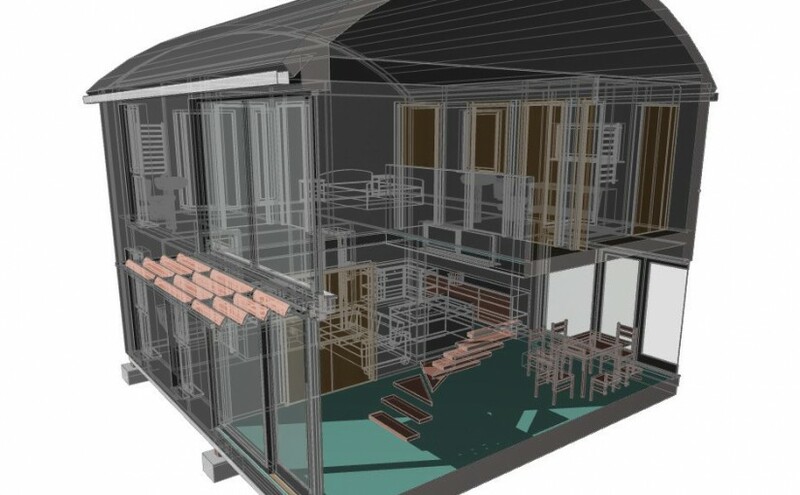 The immediate benefit we have noticed is the accuracy of coordination between drawings, and the improved communication with our clients - using the model, we can present the design in a way that is much easier to understand - meaning we can spend more time on what we are actually being paid to do (i.e. to come up with creative ideas and deliver sustainable and beautiful designs). However, this really is only the tip of the iceberg and in time as we develop our BIM skills and get to grips with national standards, we intend to really embrace the 'I' in BIM. David Holland, our technical director and BIM manager, is overseeing the transition to being fully BIM ready over the course of the next twelve months. If you're considering a project and are interested to find out how BIM might benefit you, please do get in touch with us. Since acquiring John Bradley Associates in Shipston-on-Stour in 2007, we are pleased to say that we have enjoyed continuing success, expanding the range of project types we work on, and building on our reputation as a creative and professional practice in the Cotswolds. At the same time the Bromsgrove office (David Edwards Partnership) has continued to develop a strong portfolio. Off the back of this success, and with younger members of the practice developing into competent professionals in their own right, the time is now right for us to combine the two practices so that we can pool resources and make significant improvements to the way we deliver our services, with the intention that clients receive a more seamless experience. This step will also allow us to expand into new sectors and have sufficient resources to take on larger projects so that we can continue to grow as a business and local employer. As part of the process, one of the first changes you will notice is that we will shortly be re-branding both David Edwards partnership and John Bradley Associates as Studio 27 Architects, which we hope will unify the two offices, and reflect the practice's ambition to become more prominent as a creative, contemporary practice throughout the whole of the Midlands region.